Dunfermline Abbey`s Carillon has twenty five bells which are housed in the North West of the Old Nave. 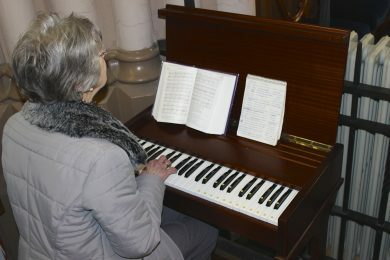 It operated by playing a small piano-type keyboard situated near the organ console in the Church. The Carillion is played prior to both services on Sunday mornings and occasionally for weddings and other suitable occasions. In 1938 the first ten bells, known as a CHIME of BELLS, were installed in Dunfermline Abbey as a result of celebrations to mark the 100th Anniversary of the birth of Andrew Carnegie in 1935. 10 bells installed in 1984 and dedicated in 1985 to mark the 150th Anniversary of Andrew Carnegie`s birth. A Carillon has between twenty three and forty eight bells. Therefore in 1984 the Chime of Bells in Dunfermline Abbey gained the status of CARILLON when the total number of bells rose to twenty five. 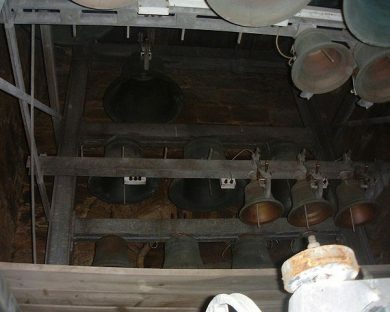 Twelve of the bells were cast by Bell Founders Gillet & Johnston of Croyden. 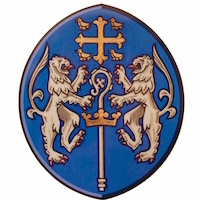 Three were cast by Mear & Stainbank of London. The last ten cast by the Dutch firm Koninklijke Eijsbiuts. They also upgraded the operating mechanism to its present form. The largest bell weighs 690 kilos (0.68 tons) while the smallest weighs 55 kilos (121 lbs). The person playing the keyboard cannot hear the natural sound and relies on an amplifier system to earphones to hear the sound of the bells. Currently there is a rota of six Abbey Church members who play the bells. The bells are housed in the North West Tower known as the Clock Tower of the Old Nave. They are fixed to a wooden frame and are hit with clappers which resemble hammers. Since 1984 the clappers have been moved by an electro-magnetic mechanism system which in turn is controlled via an interface by the keyboard situated near the organ console in the Church. Prior to 1984 the operating system was pneumatic.